... or rather CONS AND PROS, as I present them in this order. Hello, good morning, and a great day to you! It's raining in Palermo for a few days now, so it's the perfect time to blog a bit and come back to one of my favourite topics - European Voluntary Service. I suggest you check out also my blog posts about what is EVS and about the saddest part of this experience - goodbye parties. * And if you are in any way interested in keeping the EVS programme alive, please sign this online petition to European Parliament - https://goo.gl/42pb6m. We cannot lose this amazing opportunity that is changing lives of so many people! 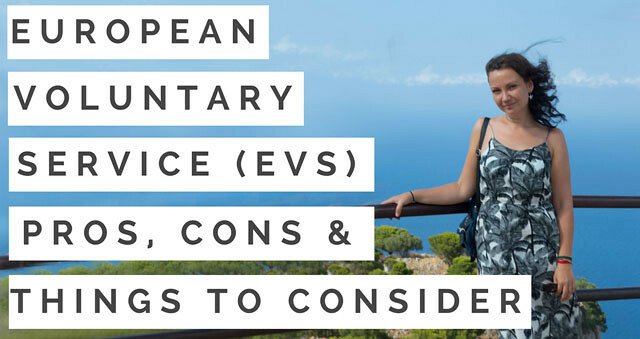 And today's post and video are dedicated to pros and cons of doing an EVS, or rather - things that can make or break your volunteering experience. Many people are dreaming about living in a new interesting country, discovering all of its attractions and feeling like a local, even for a bit. But even they need to think very hard before saying yes to an EVS experience. Depending on the conditions of a long-term project, it can last from 6 to 12 months and this is the time that you will need to dedicate to it fully. Think hard - are you ready not to see your loved ones for this long? What will you do, if you get home-sick? Will you have some money set aside to go back for holidays, if you really want to? I know people who left because they couldn't take it. But I also saw those ones, who, despite missing their families and friends, had the time of their lives during their EVS. So think about it. Before you say yes, please learn more about the country, the city, your hosting organisation, local customs and history. Yes, many will think that cultural shock - it's something you experience when you go to distant exotic places, but it's not like that at all. Trust me, for me and most of my colleagues Sicily was also quite a shock. The fact that I fell in love with it and decided to move here doesn't mean that my first days in Palermo were not... let's say, surprising. You also need to consider your colleagues and co-habitants, as these are the people who will become your tribe. So you need to be very open and calm, of something will not go the way that you used to. You might work a lot and gain skills, you might work very little and have a gift of free time. Both things are equally valuable, but you need to know what you are going to do in advance, how many hours a week you are going to work, on what schedule and plan accordingly. Make your time on the project matter. As you might have guessed, volunteers don't get a huge salary. So be ready to get adapted to your new conditions. You will need to figure out everything before saying yes, and either learn how to live with the amount you are going to get, safe some money before or set freelance jobs for yourself. The money I was getting as a volunteer was quite enough to buy groceries, cook very nice meals, go out and buy some clothes from time to time. I also managed to save some money to travel a bit. But I definitely couldn't eat out every day or buy designer shoes. So think, plan and think again. And, if you still didn't lose your optimism and motivation, I'm going to give you a number of reasons why you absolutely should do an EVS! For many young people in the EU living abroad for some period of time became a very normal thing - you can do numerous Erasmus projects, EVS, Civil Service, etc. For people with other passports, EVS can be the first and easiest opportunity to have this experience. So take it and enjoy it! You will have a real adventure, and you will have a safety net in the form of a nice insurance, your organisation's help and your colleagues. Many people are dreaming about travelling the world, but you will have a chance to actually live in your new country and see its life and realities as an insider. It's not just tourism, it's the experience that will help you see everything differently and reflect upon many things. You will have a great opportunity to learn a new language fast and efficiently, as you will really dive into it. You will have to speak with your colleagues, landlords, people in shops and on markets, and in no time you will be able to put a new language on your CV. There are many interesting projects, and if you know what you want to learn, you can get a very rich work experience. Your volunteering tasks might even help you find a new way of life and a new path like it happened with me. So make your time there matter, and you will get so much more back. Once a volunteer - always a volunteer. You will meet many new people and even after 10 years you will have something to remember when you will meet. I have friends in England, Hungary, Austria, Spain, France, Jordan, Lebanon, Nepal. And they will always be my volunteer family. So if you think that volunteering is for you - do it! Dream, plan, find projects, travel, learn languages! Don't miss out on what can potentially be the best experience of your life! And please, sign the petition. We need to protect EVS.